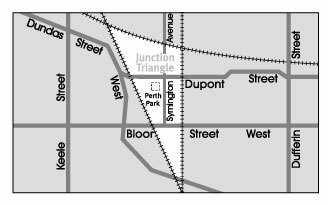 The Junction Triangle is a tiny neighbourhood located in West Toronto, roughly in the area of Bloor St., Dupont St., Lansdowne Ave, and Dundas St. West, squeezed in between the Junction, Roncevalles and Bloordale Village. The "triangle" shape of the neighbourhood is formed by the three sets of railroad tracks on the north, west, and east sides. The CNR/CPR mainline to the west, Metrolinx GO Transit Barrie line to the east, and the CPR east-west railway lines to the north. Bloor Street cuts across the middle of the neighbourhood, Dupont Street runs close to the northern edge, and Dundas Street close to the southern boundary. By some accounts, the recent residential developments of Davenport Village and Foundry Lofts, built on former factory lands north of CP Rail line, west of Lansdowne, south of Davenport and east of GO Transit Bradford/Newmarket/Barrie line, also belong in this neighbourhood. For a long time there was no agreed upon name for the area, generically referred to as West Toronto, others considered parts Bloordale Village, north of Dupont west of present-day Campbell had old factories considered within boundaries of The Junction and West Toronto Junction. The Fuzzy Boundaries project was created to try to find a new name. A vote was held in March 2010. In the end more than 200 names were suggested and 674 votes were cast. The winning name announced in March 2010 is Junction Triangle. Ironically this was the first name coined for this neighbourhood back in the 1970s. The name had largely fallen out of use, but now promises to be revived. A new signature landmark in the neighbourhood is the West Toronto Railpath, a unique, multi-use pathway that runs along a 2.1-kilometre stretch of abandoned rail line purchased by the City of Toronto in 2002. The north trailhead is located at Cariboo Avenue, north of Dupont Street and west of Osler Street. The trail extends south to the intersection of Dundas Street and Sterling Road with bridge crossings at Dupont Avenue and Bloor Street. The former spur line once serviced local industrial properties, but had not been in use for over 40 years. The railpath serves the larger cycling community as a significant off-road component of the Toronto Bike Plan. The railpath features four sculptural artworks by John Dickson, collectively named Frontier. In the meantime, new businesses are sprouting all over the place. Ubisoft and Freshbooks both have large offices here and burgeoning Sterling Road will soon be home to Toronto's home for contemporary art. There are at least four microbreweries in and around the neighbourhood, and two supermarkets. Junction Triangle's narrow tree-lined streets are framed by two- and three-storey Victorian-style houses, built mostly in the 1910s and 1920s. The brick exterior on many of these houses has been colourfully painted, giving these older homes a bit of a facelift. The Junction Triangle is already a great place to live - and its best years are still ahead of it. A three-hectare ex-industrial site is in the early phases of being transformed into more than a million square feet of new office and residential space. The Junction Triangle is currently undergoing a building boom of new townhome and condominium loft developments. As far as new homes go, this is one of Toronto's most upcoming and affordable neighbourhoods. The Galleria Shopping Centre, at the corner of Dupont and Dufferin streets, and the Crossways, at the corner of Dundas and Bloor, provide convenient, indoor shopping combined with professional services. Across the tracks on historic Dundas Street West is the "Junction Gardens" shopping district, which contains a huge variety of shops and restaurants. West Toronto Railpath is Toronto's newest bicycle path. This hard landscaped linear park runs from Cariboo Avenue to Dundas Street West. The railpath is 2.1 kilometres long and includes four site specific sculptures, extensive landscaping, lighting and numerous well marked access points. The railpath can also be enjoyed on foot, with a baby stroller or any other non-motorized means of transportation. Metrolinx is building an elevated GO rail line over the freight tracks, with a nearby station to match.